Dec 17, 2014 - TORRANCE, Calif. 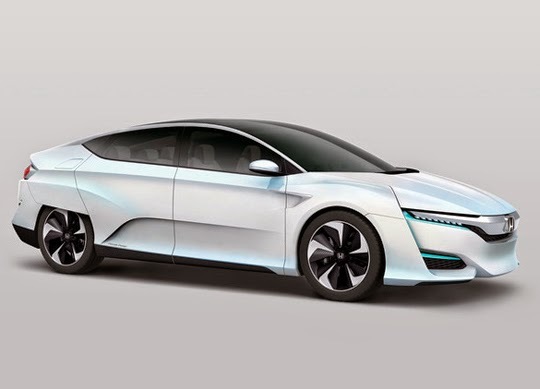 The Honda FCV Concept will make its North American debut at the 2015 North American International Auto Show on Jan. 12. Continuing more than a decade of Honda leadership in the area of fuel cell vehicle (FCV) technology, the Honda FCV Concept showcases the styling evolution of Honda's next fuel-cell vehicle, anticipated to launch in the U.S., following its introduction in Japan, which is scheduled to occur by March 2016. As the next progression in Honda's dynamic FCV styling, the Honda FCV Concept features a low and wide aerodynamic body with clean character lines. The interior strives to achieve harmony between man and machine by taking advantage of new powertrain packaging efficiencies delivering even greater passenger space than the Honda FCX Clarity fuel cell vehicle, including seating for up to five people. The Honda FCV Concept made its world debut in Japan on Nov. 17, 2014, followed by an announcement that Honda will provide FirstElement Fuel with $13.8 million in financial assistance to build additional hydrogen refueling stations throughout the state of California in an effort to support the wider introduction of fuel-cell vehicles. The FCX was the first fuel-cell vehicle leased to an individual customer (July 2005). With the FCX Clarity, Honda was the first manufacturer to build and produce a dedicated fuel-cell vehicle on a production line specifically made for fuel-cell vehicles (2008). Based on its vision of "Blue Skies for our Children," Honda is taking a portfolio approach to reducing the environmental impact of its products, advancing fuel efficiency, low emissions and fun-to-drive performance with new powertrain technologies from its Earth Dreams Technology™ lineup, which includes more fuel-efficient engines and transmissions and advanced electromotive technologies. Honda's alternative-fuel vehicle lineup includes the Fit EV, Civic Hybrid, the CR-Z sport hybrid coupe and the Accord Hybrid, the most fuel-efficient 5-passenger sedan in America1, as well as the Accord Plug-In Hybrid and the Civic Natural Gas, the only dedicated natural gas-powered passenger car available from a major automaker in America. 1 Based on 2015 EPA mileage. Use for comparison purposes only. Your actual mileage will vary depending driving conditions, how the vehicle is driven and maintained, battery pack age/condition and other factors.